Here is our selection of the best soccer cleats for the upcoming season. There’s a lot of quality cleats out these days, but this selection is of the best in our opinion. The selection is based on durability, design and overall enhancements such as stud design, lace pattern, etc. Neymar is Ready For the New Season Are You? The Nemeziz 17+ 360 Agility Firm Ground Boots from Adidas are made for the agile player. Although is made with a synthetic material for the upper part of the shoe, lining, and outsole, the fit of the shoe is tight and compressing to ensure the best fit possible. Studs are made of rubber and have a conical shape with a total of eleven spread out along the bottom to ensure maximum grip (four on the heel, two on the toes, three across the ball of the foot, and two below those). The ankle is a low cut made with a dual lock collar that provides stability and a firm grip around your ankle. The reasoning behind this is that there is no lacing. Boasting the highest mobility, the Nemeziz 17.1 uses torsion tape of the 360 agility bandage system to ensure the tightest grip around your foot. The lacing free design also allows for a more natural and barefoot-like playing style. The sole plate is not removable but is made with a torsion frame for the ultimate dynamic support. This boot gives you explosive power on dry, natural grass. The reviews are in and an overwhelming amount of players are weighing in and calling this the best boot for the season. The best choice for a nimble and spry player. Another breakout from Adidas is the Ace 17.3 Firm Ground Boots. This too is made from a synthetic material for the upper, lining, and outsole of the shoe, but is engineered with 3D Control Skin for supreme ball control. The studs are made of rubber and have a conical shape with a total of eleven spread out along the bottom to ensure maximum grip (four on the heel, two on the toes, three across the ball of the foot, and two below those), but also has total control stud alignment. The ankle is more of a mid-cut to provide a bit more protection and stability to your ankle while playing. The lacing pattern is a traditional criss-cross with thin, almost flat laces to give you bit that extra bit of touch. The sole plate if not removable and seems to be a bit stiffer than the torsion frame used of the Nemeziz 17+. This boot allows you to move with high-speed control and stability on the firm ground. Seems best to size up when purchasing these though as they tend to run small and the cut is rather narrow. The best choice for a player with speed and precision with every touch. Copa 17.3 Firm Ground Boots from Adidas are what comes to mind when someone talks about traditional boots. They are made with full grain leather for the upper and outsole of the shoe allows for perfect ball control. The studs are made of rubber and have a conical shape with a total of eleven spread out along the bottom to ensure maximum grip (four on the heel, two on the toes, three across the ball of the foot, and two below those). The ankle is a low cut style but does not compress to fit around your ankle. While this room to breath around your ankle might be good for pivoting, there is a higher risk of turning your ankle without proper precaution. The sole plate, while not removable, is flexible to ensure that it will bend with the player to allow for a flawless performance and comfort. The lacing is the standard criss-cross pattern, but since this boot is not made with compression material, it is important to ensure that when wearing the shoe that the laces are tied tightly. If you are looking for something with an overall retro look, but still made with all the latest benefits and style this boot is best for you. As with the Ace 17.3, you will need to size up for a better fit as the shoe runs a bit small. Another competitor for cleats is Nike and their Mercurial Superfly V Dynamic Fit Firm Ground should not be overlooked. The synthetic upper material is made using Nike’s innovative Flyknit that helps ensure a second-skin fit. Because of this tight fitting design, it’s designed to feel more like a sock than an actual boot and the tongueless design helps carry on that illusion. The studs are made from rubber but appear to be more bladed to ensure a firm grip on the ground and help with quick starts and stops. The stud pattern uses eleven studs (four on the heels, two on the toes, one on either side of the ball of the foot, two just below those, and one smack in the middle of the forward part of the foot) to allow for grip against the ground. The ankle cut is high and uses Nike’s dynamic fit collar to conform around the wearer’s ankle for a secure and tight grip. The sole plate has been re-engineered from those of the past models to create a lightweight plate that fits naturally to the bottom of the foot. The lacing is the standard criss-cross pattern that, when done tightly and properly across the Flyknit material, will have a tight lockdown on the foot. All condition control technology allows the player precision and unparalleled control in wet or dry conditions. The Nike Magista Obra II Firm Ground another good boot to consider when making a decision on which would be best for you. The upper is made of synthetic material, but it is also textured to enhance touches for a more natural feel for the ball. Just like the Mercurial Superfly V Dynamic, it is tongueless as well to provide a tight and secure fit as well as interior heel counter for an even more locked-down fit. The studs are made of rubber and are more of a semi-circle shape trying to give you the canonical and bladed all in one. The studs on the heel of the boot are notched to create a unique rotational zone that allows for faster turns and excellent braking while a rotational forefoot zone helps with quick turns and agile playmaking. The stud pattern on this is a bit different with only ten studs in total (four on the heel, two on the toes, two at the front of the arch, and the final two placed along the outside edge of the bottom of the foot). It’s a bit different than most boots out there. The ankle cut on this shoe is high and uses Nike’s dynamic fit collar to conform around the wearer’s ankle for a secure and tight grip. The sole plate if not removable and seems to be a bit stiffer than Mercurial Superfly V Dynamic. This boot has an asymmetrical lacing that helps expand ball control. All condition control technology allows the player precision and unparalleled control in wet or dry conditions. One more from Nike is the Tiempo Legacy III Firm Ground boot. Instead of a synthetic material, the upper part of the show is made from kangaroo leather. Combined with a knit heel, this gives the boot an exceptional touch while still giving it a lightweight feel. Since it is not made with the secure elastic material of the above-mentioned boots, it does have a tongue, but Flywire cables (similar to the Flyknit design of the aforementioned boots) are meshed with the laces to provide that tight and secure fit one wants on the pitch. The studs are made of rubber, but some are rounded and some are bladed. The Tiempo uses a grand total of thirteen studs to ensure maximum grip and maneuverability (four bladed studs on the heel, one bladed stud at the very tip of the boot, one bladed just off the side of the tip, two rounded on either side of the toes, one bladed at the swell of the ball of the foot, two rounded on either side of the ball of the foot, and two at the top of the arch). The ankle cut of the boot is low with no support around the ankle for compression or stability. The sole plate is not removable but is slightly flexible to ensure maximum play and comfort. The lacing is the criss-cross pattern but is more elastic like to help keep the tongue and shoe in place for a secure fit. A mesh liner inside the boot at the toe and midfoot helps preserve the structure of the product. This boot is best on short-grass pitches that may be slightly wet, but they are not ideal for muddy ground. Puma is a third company that produces quality boots such as the evoPOWER Vigor 1 3D Firm Ground boots. With an elastane mesh upper material, the boot gives the sense of being tight and secure without painting itself on as a second skin. The studs are made of rubber and vary between rounded and bladed to give stability and provide quick movement when needed. There are a total of eleven studs (four on the heel [two rounded and two bladed], two on the toes [one rounded and one bladed], two on the front of the arch [one rounded and one bladed], and three along the ball of the foot [two rounded and one bladed; bladed is located on the outside edge]) to ensure maximum grip and stability. The ankle cut of the boot is low with no support around the ankle for compression or stability, but the collar consists of a knitted sock to providing comfort without chafing. The sole plate is hard and rigid and does not conform well to the wearer’s flexing motions, but it is lightweight which helps to balance out the stiffness. The lacing is almost a hybrid of the criss-cross and bar pattern. While the laces themselves do follow the criss-cross pattern for a more secure fit, they also are farther apart like the bar pattern. The exposed AccuFoam 3D dots enhance comfort an kicking accuracy as well as give the boot a unique look. The boot is suitable for use on firm natural surfaces. Another boot from Puma is the evoSpeed Fresh 2.0 Firm Ground. It has been designed to weigh as little as possible to ensure your speed is at the maximum it can be. The upper material is a synthetic mesh that helps regulate the temperature inside of the shoe and keep the wearer nice and cool. The studs are made of rubber and combine a mix of rounded and bladed to help with speed and control. There are only ten studs (three on the heel [two bladed and one rounded], two at the toes [both rounded], three across the ball of the foot [two rounded and the middle is bladed], and two at the front of the foot’s arch [both bladed]) total on the bottom of this boot. The ankle cut of the boot is low with no support around the ankle for compression or stability, but the collar consists of a knitted sock to provide comfort without chafing. The sole plate is practically non-existent in the design of this boot. In trying to keep the weight of the product down, the studs are right on the bottom of the boot with little reinforcement to keep them balanced. The lacing is a traditional criss-cross pattern to help keep the shoe tight and fitting as possible. Other ways they’ve kept the weight down is a minimalist support frame in only key areas and they’ve integrated a minimalist heel counter. The boot is best for use on firm natural surfaces. The final boot from Puma is the evoTouch Pro Firm Ground. Designed to give the wearer the best touch on the pitch, the upper material meshes with an ultra thin layer of K-touch leather for ultimate ball control. The studs are made of rubber and are all conicalin shape. 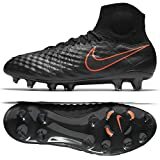 There are a total of eleven studs (four on the heel, four along the outer edge of the boots, and the final three on the inside edge of the boot) to ensure maximum grip and stability. The ankle cut of the boot is more of a low with the knit sock collar to provide comfort, but the back comes up a bit higher to provide a little bit of extra protection. The sole plate is rather flexible and lightweight so it conforms easily to the wearer’s stride. The lacing is a traditional criss-cross pattern to help keep the shoe tight and fitting as possible. The boot also has an insole and heel tape to help eliminate slipping inside the boot. The boot is best for use on firm natural surfaces. There is no one cleat that is best suited for all players. We each have our own attributed design to what we want to look like and play like on the field. 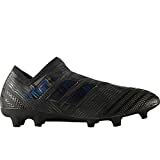 In short, instead of thinking of the “best soccer cleat” think of the “best soccer cleat for me” and you’ll find that you’ve made a considerable effort to not only improve your game, but knowledge of what each cleat offers. 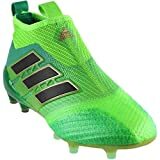 It takes no brains to see that the adidas nemeziz are the best cleat hands down.